Summer is officially approaching and my inbox is increasingly being filled with Beach Prep press releases. 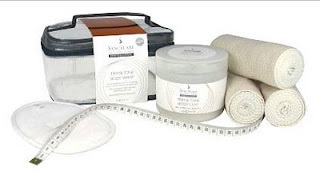 One which did catch my attention was from the PR for The Sanctuary, suggesting their Professional Body Care Range and I was sent their Trim & Tone Body Wrap to try for myself. At £25.52, it's designed for those who want to recreate the effects of a spa treatment at home, for less. I'd say you get approx. 2 uses out of the kit so it represents good value for money compared to a professional treatment. I really like that the kit includes everything you need to perform the treatment, from an exfoliating loofah mitt to a tape measure, which shows that it's been well thought out. It's actually the next part which I struggled with the most and which I think is the flaw in this treatment- you have to relax in a warm environment and sit still for a minimum of 60 minutes. I appreciate that this is important so that the treatment can work and that you'll see results but I don't know many women who have a spare 60 minutes to spend sitting around (in addition to the time consuming preparation). I found it surprisingly difficult to do this in my own home as I kept thinking of chores I could be doing whereas had I been at a spa, I'd have had no choice but to relax. When it came to remove the bandages, I have to say that I didn't have particularly high expectations that it would have delivered results. I was pleasantly surprised to immediately notice that my thighs were looking firmed, making cellulite appear less visible. When I came to measure myself, I noted that I'd lost 6cm across the areas I'd treated (stomach and thighs- the treatment can also be used on the arms), impressive for a home treatment!